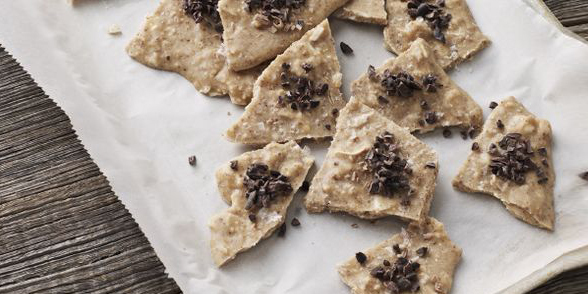 This Almond Butter Bark is one of Sarah Wilson's favourite treats! Sarah says "hand it out to fans of salted caramel and see if it doesn't make them smile in blissful surprise". 1/3 cup coconut oil, melted. 1/4 cup almond spread, slightly warmed or melted. handful cacao nibs (you may also use 85% dark chocolate shavings. 1. Line a baking tray with baking paper. 2. Combine the oil, almond spread, coconut flakes and syrup in a bowl. Spread on the tray and sprinkle with salt and cacao nibs. Freeze for about 20 minutes, then snap into shards. Store in an airtight container in the fridge (the shards will melt if left at room temperature). Don't have any almond butter? Combine 80g softened butter and 1/3 cup of almond meal or LSA. Peanut Butter and Jelly Bark: Replace almond butter with peanut butter. Omit coconut flakes and cacao nibs. Add ½ cup of frozen raspberries. Salted Dark Chocolate: Replace almond butter with macadamia or cashew butter. Omit coconut flakes. Add 2 tablespoons of raw cacao. Tahini and Pistachio: Replace almond butter with tahini. Replace cacao nibs with chopped pistachio. We advise eating sweet foods like this one as occasional treats only.